I’m in the process of developing characters for two new love stories, and I’m wrestling with creating people who will be real to my readers. At the same time, I’ve discovered I fell into the stereotyping pit in developing my fictional hero and heroine. In the next novella of the Fitzpatrick Family series, my preacher’s daughter heroine is any parent’s nightmare. In the final book of my military romance series about starting over, my retired Army colonel hero is a tough old bird unwilling to show vulnerability. Of course, the characters can be exactly that way, but Holly Gerth’s blog got me to thinking. Do they have to be? Too often (and too quickly), we lump people into categories because of a common characteristic or trait rather than think about their story. I know from personal acquaintances the stereotypes I created are not necessarily true. Army officers can be compassionate and alpha at the same time. All preachers’ kids are not rebellious. As a writer, I was being sloppy with my characterization so I started over and interviewed both characters, one at a time, again. I discovered some amazing things that un-stereotyped them both. Things that altered the plots of their stories. Things that will make both novels more interesting. 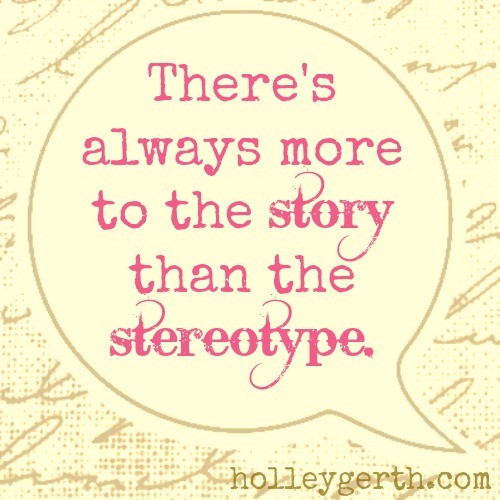 Whether writing or dealing with people in our everyday world, stereotyping is the easy way, the lazy way. A trap we shouldn’t fall into. Wouldn’t you agree? Oh so agree. Two women whom I know and love are very over weight. Those people have been treated horribly because one look and they are type case. Type casting has caused mistreatment in both every day situations and also in medical situations. You have no idea at all who is inside that body. I believe type casting should have been he 11th sin. So spot on, Connie. If only we’d pause for the rest of the story. Sigh. Thanks for stopping by the porch and commenting. Glad you agree. We can change things one person at a time.